At 66 degrees, 32 minutes north, the Arctic Circle delineates the beginning of the rugged, expansive, and often frozen Arctic region. Ecosystems with specialized flora and fauna are in delicate balance and vulnerable to changes in climate and pollution. Throughout the Arctic glaciers are retreating, sea ice is in decline, and the region is under pressure for mineral and oil exploitation. Before facing these environmental challenges with action, we must first pay attention. I have traveled twice to Greenland where I have painted alongside scientists as well as in local communities. The result is a collection of sketches, paintings, and stories that I hope may spark interest in and stewardship for the Arctic and our global environment. I traveled to NE Greenland in 2010 to join Danish biologist Dr. Erik Born’s research camp on Sand Island. Located at the head of Young Sound approximately at 74°15’44” N, 20°9’44” W, Sand Island is a small (1000ft x 1500ft) sandy terminal moraine. During the summer months, the island is a popular haul-out site for walruses that feed on clams in Young Sound, as well a nesting site for birds. Working with Dr. Born and his team studying walruses and surveying Arctic Terns, I explored the local natural and cultural history. I returned home from Greenland with more than 100 field sketches, as well as audio recordings and photographs. My fieldwork illustrates elements of life and research in the high Arctic and is the foundation for a series of paintings exploring the migration of Arctic Terns (the world’s longest) and the environment, as well an educational multimedia presentation and workshop. Read more about my field experience in this series of blog posts. From April through July, I had the opportunity to explore western Greenland as a Thomas J. Watson fellow. My voyage began in Kangerlussuaq, the airport town that is a popular base for research projects and their logistics. From there, NSF granted me the opportunity to fly on a C-130 Hercules aircraft to Summit Camp, a US research station located at the peak of the Greenland Icecap (10,530 ft), and prospecting diamond geologists invited me to their drill sites. Next I traveled by boat north to the Upernavik region, where the Upernavik Museum hosted me for seven weeks as artist-in-residence. While living in their small Refugium house, I observed and painted the spring thaw of ice breaking up, melting, and drifting away. 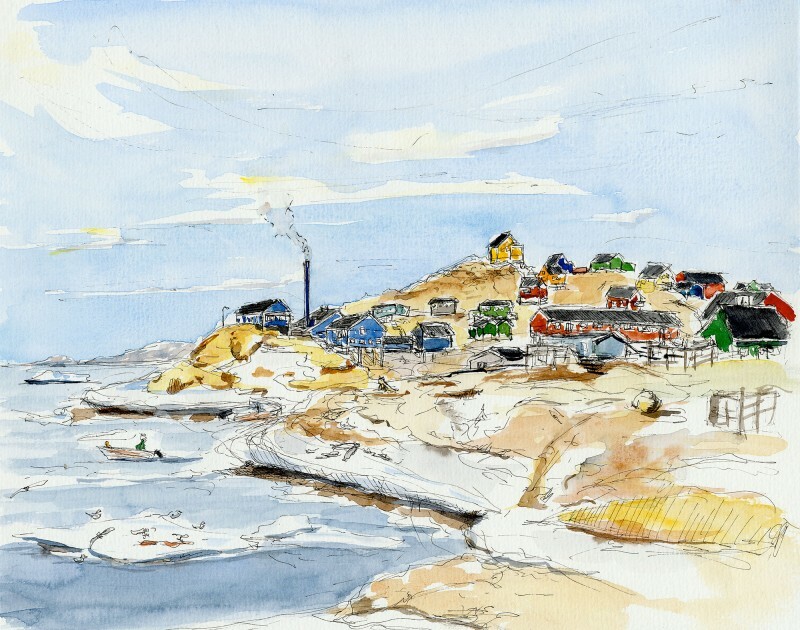 See paintings and field sketches from east and west Greenland. This collection features sketches and paintings from Greenland and Antarctica. Available for purchase in print or download for free. Generous support helps make my fieldwork possible. I thank Dr. Erik Born, Nanok, the Thomas J. Watson foundation, Kangerlussuaq International Science Support Center, the National Science Foundation, C2M Hill Polar Services, the "Diamond Crews", Upernavik Museum, WINGS World Quest, and everyone who graciously hosted me during my travels. My new 360° panorama consisting of five panels and based of field sketches from Sand Island, NE Greenland. Join me for the “Ice Stories” exhibit opening this Sunday at the WA State Convention Center. Learn about my encounters with polar bears in NE Greenland- sketches, photos, and multimedia!